Do you have a budget? 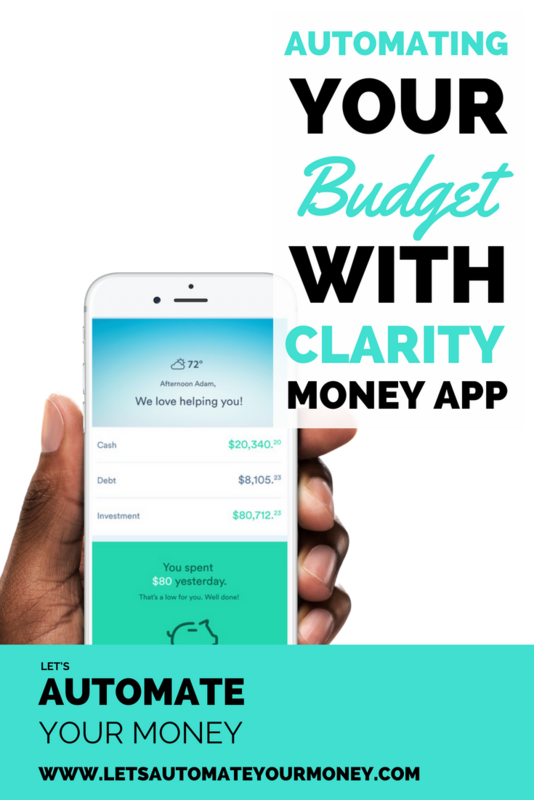 If not, Clarity is a new app that gives you a lot of insight into your money. It provides an automated budget and lots of other cool features. I break down what's inside and whether it's worth your time in this post. Check it out! So, I’ve been seeing a lot of talk about Clarity Money lately so I thought I’d dive in, give it a try, and report back to you all whether I think it’s worth it or not. I downloaded it on my iPhone and the first thing I noticed is the design. It has a modern and clean design. While that’s not going to help your finances, it’s always a plus when an app has great presentation. After creating an account, I linked my checking account so it could analyze my income and spending behavior. You can also add any credit card accounts you have as well and you definitely should if you use any credit cards so it can get a full picture of your spending. The app breaks up sections by “cards.” It’s kind of a cool way to organize the data. Here’s how each card breaks down. It starts off with a header that gives you the temperature and weather. Not anything I absolutely need, but it sure doesn’t hurt to get a little inspiration. The first thing you will get from Clarity is a snapshot of your current account balances. Nothing new, but it’s nice to have quick access to your account balances. One thing that is really nice is that it does integrate with Siri for you iPhone owners. You can ask Siri what is my account balance for a quick update, which is pretty cool! The next card shows you how much you have spent in the last few days. It’s nice to get a quick recap of all of your latest expenses. Best of all though, is that it will track your income and expenses and will attempt to tell you if you are on track or not. This helps with budgeting and tells you whether you should stop spending your money if spending has gotten out of control. This card quickly tells you how much money you’ve brought in to your checking account so far this month. You can also press on it to see your list of income transactions. This is pretty cool. It’s simply a countdown to how many days until your next payday. It has to see your income for a month to be accurate, but it’s a fun feature. This chart is where Clarity really becomes a useful tool. It breaks down how much income you have coming in monthly and all the expenses you have spent. Finally, it shows you your left over amount. This takes it from being simply a transactional app to an automated budgeting app. What Did I Spend On? This is another cool card that allows you to input any expense and find out how much you’ve spent on it over a certain time. Curious how much you’ve spent on gas or Starbucks over the last month? Another budgeting feature, this card allows you to see how much your spending on various categories of expenses and even creates a chart to show you the data visually. It breaks down all of your spendings into categories like shopping, bills, food, etc, so you can see at a glance see how much you are spending on the various categories. Now, this is really cool. Clarity will analyze your subscriptions and show them to you on a list. These pesky little reoccurring charges can be real drains on your money and this can help you eliminate them. You can even cancel some subscriptions right from the app. Lastly, they provide a snapshot of your credit score right in the app. This is becoming a common thing, but Clarity provides your credit score right there in the main screen. No clicking around. I like this because you can easily review your budget, spending, and even see your credit score with a quick daily scan. Now, you will know when your score changes without logging into a separate app to find it. You can even press on it to see all of the factors they used to determine your credit score! Boom! That’s pretty easy. I like it. It’s basically an automated budgeting app with a bunch of extra cool features. I use to use an app called Level Money, but that app was eventually shut down. It had similar features that helped automate budgeting for you. Clarity seems to fill in the spot that is missing in the app world without Level Money. Plus it’s free! Give it a try and I think you might like the insight it will give you into your money. Enter your email address below and gain instant access via email. Are Millennials Really Bad with Money?